Need something light for tonight’s dinner? My family does. So, I prepared this vegetables broth with fish cakes, tonight. Vegetables, good for health, great for dieting, and excellent for taste, too! I used fish cake slices as I think fish cakes go well with this vegetable broth. I did not use any ribs or meat in this soup. As usual, I added my favourite seasoning, chicken stock cube. Just half a cube used, this vegetable broth has becoming an extra delectable soup. Well, if you insist on just vegetables broth for your dieting program, please skip the fish cakes. Even for chicken stock cube, you may change it to vegetable cube instead! I believe it will taste even better… Anyway, vegetables broth is simply perfect with various combination of ingredients. Make it a nice one! Just 30 min (include 20 min of boiling time), this fragrant and delicious vegetables broth will be served. 1) Heat up a pot with sesame oil. Add chopped garlic. Stir fry till golden browned, quickly add in water. Bring the water to boil over high heat. 2) Add chicken/ vegetable stock cube. 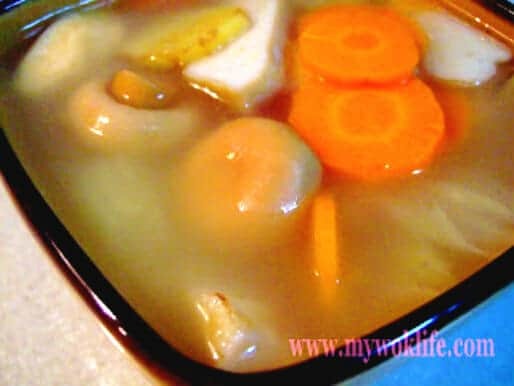 Put in carrot, Chinese cabbages, fish cake slices, and ginger, when stock cube dissolved. 3) Reduce heat to low fire, simmer for 20 min – 30 min. Add the button mushroom, and stir in salt and pepper, 5min before heat off. Serve hot. This low-fat vegetables broth with fish cakes counts about 110kcal for a regular bowl, while clear vegetables broth counts only 60kcal for a decent portion. No worries about calories-count! Tips: Fry the chopped garlic using sesame oil before adding water to boil will make the soup more fragrant and tasty. *Vary your combination of ingredients, if desired. I tried prawns, fish tofu, and fish ball in stead of fish cakes, in my previous cookings. *If cook solely vegetables broth, try adding tofu (beancurd). *Chinese cabbage (long type) is more suitable to make into broth than the round type of cabbage. More tender and less ‘greeny’ taste.